Kili & Truman are moving to the new house where Santina has already been in quarantine. Now that Santina is clear of infection and moved to the big room, the smaller room - originally planned for cages - is now vacant. Having had a powder coat steel cage for Kili and aluminum Kings cage for Truman, I knew immediately what I'd be getting the birds at the new house. After having Truman and his cage for 4 years, I continue to stand by the original review I did of the aluminum cage. It's expensive and it's not perfect. But it's the best cage for the money hands down. Powder coat cages just aren't sufficient in quality. Inevitably after a lot of use and washing, the coating comes off and they rust. Stainless steel cages are unbearably expensive. The aluminum cage is lighter in weight, easy to assemble, and overall good quality. For the price, I think the aluminum cage line provides the best bang for the buck. At roughly double the price of a comparable powder coat cage, you get the benefit of non-corrosiveness that you can get from stainless steel at even twice more. As you folks probably know by now, I'm more value driven. I don't mind spending more but I hate spending more when I don't feel a sufficient benefit to justify the price. That's why I think a cage made from aluminum is the perfect compromise. When you think about the long lifespan of a parrot and estimate the value you will get out of a cage, paying more up front for a cage makes more sense. Let's say the parrot will live 20+ years but the cage won't even make it that far. Depending on how bad you're willing to let the cage get before replacing it, I'd say it is reasonable to say that 5-10 years is realistic for the powder coat and 10-20 for the aluminum. Stainless might last even longer but if it's poor quality stainless it might not. Usually the hardware, hinges, food doors, etc will fail before the bars and the hassle will make the cage need replacement regardless. So if the aluminum cage can solidly last twice as long, at about twice the price it's a good deal. This is because you're getting a better cage with thicker bars during that time. There won't be any rust or chipping even when the cage begins to be less than desirable to keep. Only one company makes aluminum parrot cages so there's no shopping around, Kings Cages. There is only one cage design to choose from but two sizes. I just call them the small aluminum cage and the big one. Kili is getting the small one which measures in at a sizable 25"x22"x45". This cage has 5/8" bar spacing and is great for Senegal Parrots, Conures, Cockatiels, Quakers, and other similar sized parrots. Considering that Kili is moving up from a 18x18x32 powder coat cage, it's an immediately obvious improvement. Back when I got Kili and that cage, I didn't know any better and until I was moving didn't find the chance to replace it. Truman on the other hand is getting a new version of the same cage he used to have as well. This one is 33"x25"x49" and makes a good sized cage for a Cape Parrot, Timneh Grey, Galah, or Smaller Amazon. I'm not sure if I would keep a CAG in this cage though. Maybe a smaller CAG yes but not the really big 600g ones. The Aluminum Kings cages in 2 sizes come in 3 styles: standard, arch top, and play top. To me, all but the dometop are a waste of money. The playtop is expensive and not beneficial. Parrots will play on top of their cages with or without one and frankly a separate tree or stand is much better to have. The standard cage loses a lot of good living space without the archtop (playtop version included). For just a few $100 more and not a substantial amount in proportion to the main price, the living space is greatly expanded. There is a downside to the dometop though. Clumsy and baby birds can have trouble climbing around on it. When Truman was a baby he used to have trouble getting around and would fall off. But for agile adult birds this is no factor. It's also a bit of a pain trying to reach up and around to clean the dometop from inside. I am handy with tools so the fact that the Kings Cage is so easy to put together plays little role. But, for most consumers this is a huge plus. It comes in just 8 pieces and all but the top two of the arch just snap together. The arch top connects with just 4 standard screws. Assembly is easy but you must pay attention that alignment is perfect or it won't come together. It only took 10 minutes to assemble the small cage by myself and then 10 minutes to assemble the big one with the help of my brother. As I said in my first review, I don't like the wood dowels and plastic food cups.I immediately replace these with stainless steel cups and natural or NU Perches. The cage is actually a bit harder to clean than the powder coat one but not substantially enough to make it less worthy. The lighter weight and mobility make up for that. Another issue is plastic handles for the food doors can potentially be chewed off by any parrot. Most of the flaws are little nit picks and nuisances whereas the cage overall is solid, durable, and reliable. So is it my dream cage? Does it have every feature/quality I'd want in a bird cage? No. But it is by far the best quality and value cage I have encountered and the one that I choose for my parrots Kili & Truman. Let's talk about big birds and cages. I'm not doing this to make anyone feel bad but hopefully to inspire people to do better. I know I've made mistakes with cage sizes and want to help you realize some of the conclusions I have come to. I'm gonna play novice bird owner/shopper. So I decide to get myself a macaw so I go to google and search for parrot cages. I pull up the first site I find and look how convenient, it says I can search by "breed" (breed, really?) for cages. Anyway, they have a Macaw breed so I know this must be the right kinda cage. I figure I won't splurge out and get the top of the line but I don't want low end either so I find something mid-priced of what they have. $550 gets me 40x30x66 in powder coat. Not the smallest nor the biggest macaw cage (although the biggest ones offered are barely bigger at 48x34x70) while the smaller ones aren't even 3 feet wide. I don't know Santina's measurements yet but let's say from wikipedia it says Greenwings are up to 37" head to tail and 49" wingspan. Holy moly, a 49" bird in a 36 to 48" cage? Maybe if we trim off the wingtips a little it could just make it if it stands in the very center of its perch!? We think budgies get shafted with those tiny cages but they can hop and sort of fly in those! The big birds are the ones who really have it badly. Worse yet, those "macaw cages" usually can fit only a single perch (will be lucky if it's not a dowel!). The bird's tail is so long that if you put a perch lower its tail will drag and if you put a perch higher, it will hit its head. I have often likened keeping a Green Winged Macaw in a "macaw cage" to keeping a cockatiel in a shoebox. Well my friend Ginger, who runs a rescue for Senegal Parrots and Cockatiels, did a little measuring for me. Turns out a Cockatiel's wingspan is about 14 inches and a typical shoebox about 12 inches long. That is a bird confined to a space smaller than its wingspan. Yet even the most modest of Cockatiel cages are 16-20 inches across. Ginger states that, "The cage most of the Cockatiels come in is the same kind from petco: 20 long, 16 wide, and 33 inches high but it's really not that much as it is a dome." Not that I advocate such a small cage for a Cockatiel, the bird still has more than a wingspan of width and 2-3 height levels it can climb to. This at least provides space for a modest variety of perches, wing stretching, and some activity. Yet the cages marketed for macaws don't span up. I know $500 or $1000 on a cage sounds like a lot of money and that it must buy something fantastic. But price and seller offerings have nothing to do with what birds actually require. We're not even talking about getting a super roomy cage here, just the bare minimums. Imagine being confined in a room or space small enough that you cannot stand up or extend your arms all the way? That wouldn't even be considered a room but more like a box! We take for granted having enough space to at least be able to stretch in any direction. Convicts, murders, and rapists have more space in their jail cells (typically 6'x8') than a perfectly innocent, beautiful, loving, and adored macaw has in its cage. Without knowing Santina's actual dimensions yet, I can tell you that she takes up all of her 32x22x22 plastic carrier. She can travel in it but I would not expect her to be able to live in it. I cannot begin to imagine keeping her in a cage this isn't even double that size (most are 48x30x60 or less)! I'm not trying to harp on people who have macaws in cages just because I have Santina in a room. I haven't given this as much thought until now. This is more to discourage people from getting macaws in the first place without having sufficient space for an entire bird room or aviary and to encourage those who already have macaws to find ways to get them more space. 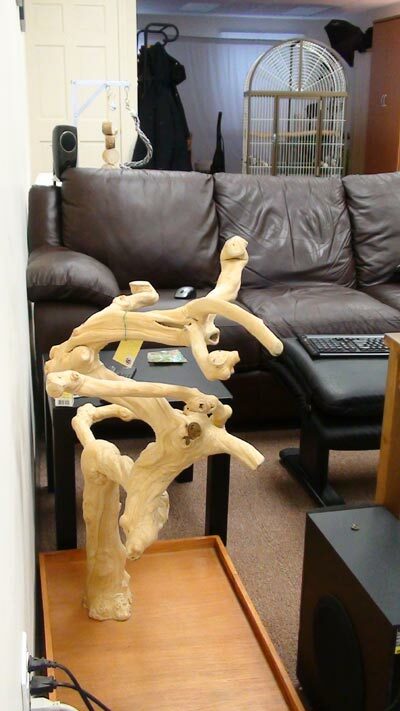 The absolute maximum size macaw cage available really only meets absolute minimum size requirements. These are the absolute minimum requirements for a long-term bird cage not to be animal cruelty in my opinion. We should strive to give them as much space as we possibly can but if a cage does not meet those minimums, it should not even be considered. 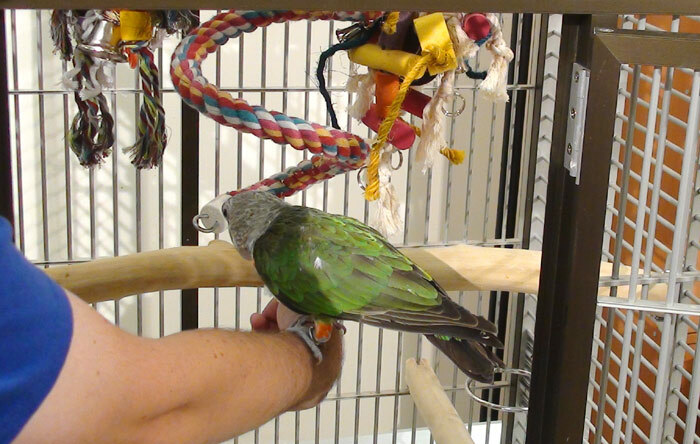 One problem I've run into when chatting with savy parrot owners is that it was difficult to impossible to establish baseline cage minimums with them. Everyone had a different opinion on the subject and many people would take whatever the minimum used to be and add a few inches and call that the minimum. I think it is well intentioned and I hope everyone strives to go well beyond the minimum. However, there has to be some kind of minimum in place below which it is just not acceptable and that is the one based on wingspan and perch quantity. Without this concrete minimum, it is hard to say and compare what kind of parrot personality requires what kind of size. All other personality/species differences can be added on top of this but no cage should ever be smaller (except perhaps in the case of a specially handicapped, baby, or injured bird). If you want me to make a general suggestion about what I think a good cage size is as opposed to the minimum, I would say double the minimum is a great place to be or the biggest thing above minimum that you can possibly accomplish. Out of interest sake I measured Kili & Truman's wingspans for some comparisons. What is the wingspan of a Senegal Parrot? 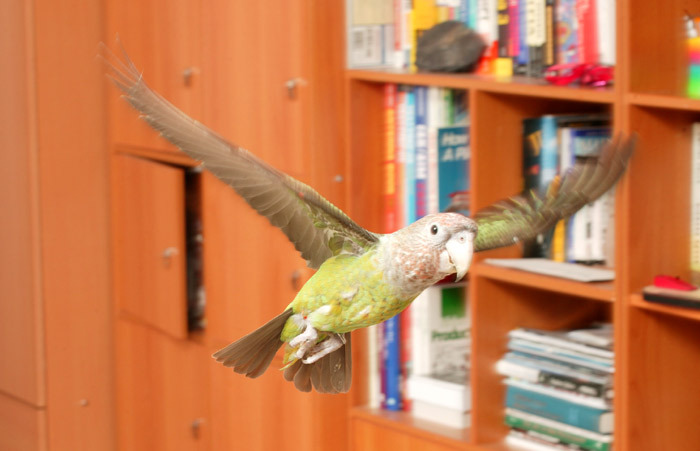 Kili is a below average sized female Senegal Parrot with a wingspan of 18 inches. Ever wondered what a Cape Parrot's Wingspan is? 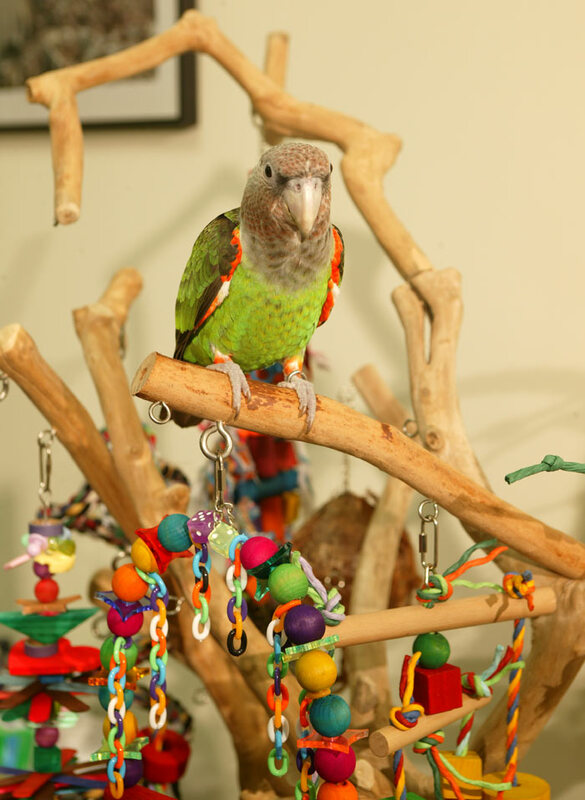 Truman who is a mid to large sized Brown-Necked Cape Parrot has a wingspan of 26 inches! Who would think it's so much just by looking at them. Folded up, these birds don't exceed 12 inches in any direction. Now let's see how their cages size up. I don't think Kili's cage is big enough but it's what I naively picked because I didn't know any better back then. I didn't find it worthwhile to throw it out to get something a little bigger so instead I focused on out of cage, aviary, and outdoor time. When Kili moves to my new place, she'll be getting a 25x22x63 aluminum dome cage just like Truman's. If Truman plays nice with Santina and I can leave them out together in the big room, Kili can have the entire little room with an open cage policy. If not, then Kili & Truman can have cages in the small room Santina currently occupies. These guys grew up in cages and are used to them. Kili's cage works out to a full wingspan wide for her and she has 4 perches. So while unfortunately on the minimum end, I would consider this an acceptable cage (but hope for bigger). Truman's cage is 1.8 wingspans wide and has enough room for 5 perches, loads of toys, and still a lot of unoccupied space. That is a much better cage size for a Cape, Grey, or Amazon parrot. Ideally I would like a bit bigger but this is as big as aluminum cages come. The compromise for having an uncoated and corrosion proof cage is worth it. Now that you've heard my thoughts about absolute minimum cage size, measure or research your parrot's actual wingspan and compare it to the cage size. If it is more than the size of the cage or the cage doesn't have a minimum of 3 different perches the bird can spend time on, get a bigger cage! If you're looking to acquire a big parrot (whether from store, breeder, or rescue), don't listen to them for a second about cage size if it doesn't at least meet those 3 minimum rules and really look for bigger. The time has come for savy parrot owners to take a stance and say it is not acceptable to keep birds in cages that they cannot fit in fully. Then take it one step further and provide the biggest cage or living space that you can. Your parrot spends more time in your house than you do so it's definitely worth it. On Monday December 23, 2013 I adopted Santina a rescue Green-Winged Macaw. But the story goes back a bit and I'd like to take this opportunity to share it with you. I have been preparing to move to a new house for over a year now. The renovations have been ongoing and delayed. As a part of the move, I had a big bird room being built and this was an opportunity to house any sized parrot I could dream of. About this time last year I began looking into acquiring a baby Green-Winged Macaw. I was on a waiting list for a baby once eggs were hatched. Infertile eggs and cold temperatures kept pushing things back until what was supposed to be my baby hatched in the spring. The plan was to acquire an unweened baby macaw to be trained for outdoor freeflight. By that point, I have been noting tremendous success indoor freeflying Kili & Truman and craved the challenge of flying a parrot outside. But according to most expert sources that I had encountered, the consensus was that you can only succeed with outdoor freeflight with a large parrot that was weened by the trainer. Furthermore the bird was to become a performer much like Kili & Truman and I was warned that anything but a baby might not be good for that purpose. Note: hand feeding unweened baby parrots and/or outdoor freeflight bears a high level of risk and is complicated beyond the scope of any advice I can give. Virtually all pet parrot owners should not attempt either and those who do should seek out expert advice. Unfortunately the baby greenwing aspirated while still under the care of the breeder. During my preparations to freefly the baby macaw outdoors, I had done a lot of contemplation that led me to begin freeflying Kili outdoors. Kili was already on track to be a star free flier with her gym flying, harness flying, outdoor super socialization, nyc visit, and motivation optimization. In a way, it was the prospect of freeflying the baby macaw that got me used to and accepting of the idea enough to try it with my adult bird. From that point on, everything changed. 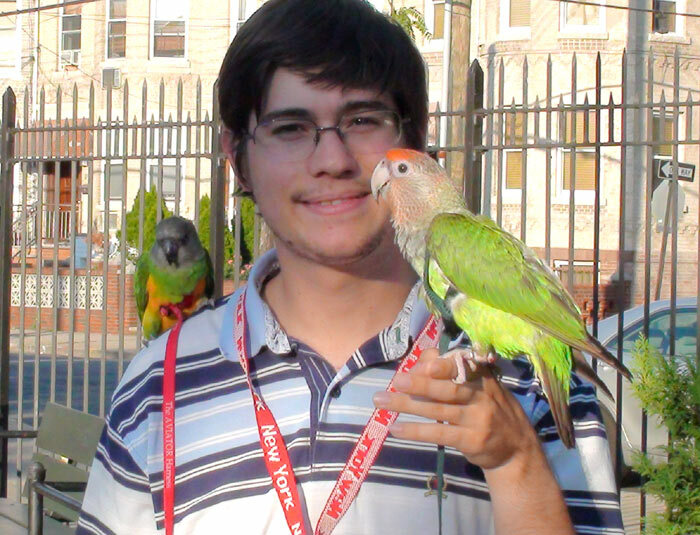 I released my book, The Parrot Wizard's Guide to Well-Behaved Parrots. I was touring all around the country presenting my training methods. And I had done a lot of work with rescue parrots. The culmination of these factors, personal growth in training capability, difficulty in finding the right baby, and the importance of helping rescue birds lead me to seeking an adult macaw for adoption. I don't believe in adopting rescue birds just because or simply out of sympathy. I see a lot of people in the bird community burn out because of these reasons. I think rescue parrots should be adopted on merit and benefit to bird and owner. There are too many reasons to go over here but there are definite pros/cons to adopting and there are plenty of cases where adopting a rescue rivals getting a baby. I may write another article later about how it turned out better to adopt Santina. Finding the right rescue is not necessarily an easy matter either. You have to research around and find the right rescue with the right attitude and most importantly the right bird for you! This may require some distant travel but for a bird that will live with you a lifetime is not something to skimp on! I had already been looking nationwide for a suitable baby so distance made little difference on finding a rescue. When I learned that Lazicki's Bird House & Rescue is in Rhode Island, that felt like right in my backyard compared to the far search I had been making. 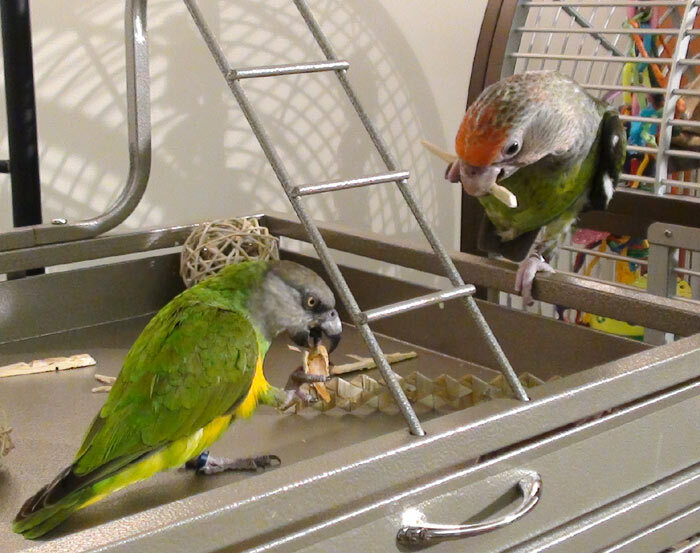 The first thing you want to learn when choosing a rescue (after all there are many bird rescues but you only have the ability to support one at a time) is about their reputation in the bird community. Talk to local bird clubs, people who have adopted from that rescue, and volunteers at that rescue to get an impression what it's all about. I was hearing about Lazicki's in the news, from other rescues, and from adopters so I already had a favorable first impression. The rescue had several Green-Winged Macaws but everyone thought off the bat that Santina would be the right one for me. Given that those people have been around the bird and I haven't it was wise to take their advice and then test it out for myself. The next step was to go and visit the rescue and the bird. To an extent it does matter what kind of care the rescue provides the birds. Naturally supporters of rescues want to support the ones that do a good job and let the ones that do a poor job go bust. However, it is impossible to hold them to the highest standards. They do things on a tight budget, they have a lot of birds, etc. So discounting these things, the things to look for are that the birds are healthy, treated properly, and that the rescue's policies are acceptable. Things like cleanliness, out of cage time, cage size, etc can be discounted from ideal (as long as they are not abysmal) as the rescue is only a temporary location for the birds. You want to look for minimum standards being met at the rescue and use that as an opportunity to provide maximum ones in your own home. I won't spend too much time commenting on the appearance of the rescue facility when I visited because they will have moved to a new location by the time this article is released. So there's no sense in analyzing the facility I was visiting that they were in the process of replacing. The things that I didn't like were much the same as would be the case in most any rescue: the birds are clipped, not trained, cages are too small, etc. What was more important was that the rescue was open to the ideas of training, flight, cage-free lifestyle, etc. 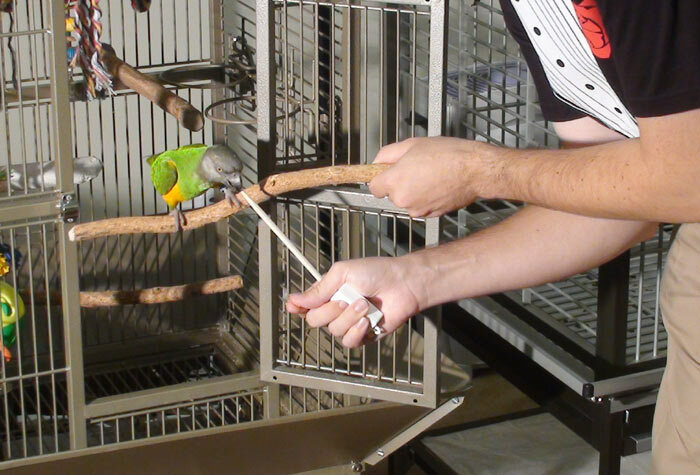 What I would not accept is a rescue that would mandate me to clip the bird or engage in similar unacceptable practices. I did not have any expectations to find a flighted rescue macaw. I visited the rescue a month prior to adoption to meet Santina and go over preparations I would need to make in order to adopt her. We discussed diet, space requirements, behavior, and medical care. Santina did not want to step up for me but Steve did put her on my arm. She gave me a few nips but otherwise was content to just sit on my arm and preen herself. What I found was that she is not aggressive but rather regressive. In other words she does not come over to bite you but if you come after her, then she will. This is a much easier situation to work with. Just don't do the things that make the bird have to defend itself (and that is usually unwanted handling). Steve, the founder of the rescue, is a nice guy (even if he tells you that he doesn't give a damn about you as long as the bird is ok!). His heart is in the right place and he is foremost concerned about the long term welfare of the birds. He shares my view that flight is essential for parrots and that they enjoy working for food (even if they are unable to provide those opportunities at the rescue). On adoption day, Steve and I went over pictures of the place I'd be keeping Santina and took care of some paperwork. Then we went over to check out Santina. I could tell that she did not want to step up for me so I tried to divert the animosity by chatting with Steve nearby. I learned that Santina was hatched on September 13, 1999, had a single owner who had to give her up for personal medical reasons, and that she had a tendency to hate men. Also it turned out Santina was previously named Santino and thought to be a male until she laid an egg at the rescue. Otherwise little is known about her past and I would be left to discover her behavior and personality on my own. Santina did not want to step onto my arm and tried to bite. Steve forced her onto my arm and then Santina gave my arm a bit of a bite. There's no question why she bit. She did not want to go and then was forced to so she bit in order to not have to be on my arm. A large part of the problem was that the bird was bonded to Steve, had nothing to gain, and everything to lose by stepping up for me. She was already fed, uninterested, and defensive. She could not be sure if I was sturdy or safe so her best course of action was to bite rather than step up. This is one place I fault the rescue on not using socialization techniques to make visitors a highlight of the birds' day rather than a downside. It certainly makes the prospect and decision of adopting a parrot that does little more than bite you quite a difficult one. The decision to adopt Santina was bitter-sweet. From a logical stand point she was a good bird, the right kind, and had a lot of potential. But in the introductory phase there was little bond or relationship between us that would be indicative of any sort of preference. Furthermore the rescue gave me little stimulation that the bird was ideal for me. Most of what I was hearing was about how I'd be ideal for the bird and little the other way around. What I had to remind myself of was the fact that a clever rescue could have just as well manipulated the situation (like a used car salesman) to make it seem like a good idea. Ultimately the decision and the risk was entirely mine. I decided that with my training capability I should be able to turn any bird around regardless if it chose me or not. Santina did not want to go into the carrier. Let me rephrase that, she desperately did not want to go into the carrier and Steve had to do a double take to shove her in. Absolutely not the approach I'd wanna use but this was not the time to stand around figuring it out. I learned that Santina is phobic of carriers during that episode and also while walking her near a carrier since. Once in the carrier, I wasted no time loading her in the car and heading home. The giant macaw clung to the bars during the span of most of the car ride despite the perch I put inside for her. At home I opened the door and tried to coax her out. After the bites she had given me at the rescue I was a bit leery of putting my arm in a confined space with her. Worse yet, every time I reached in her beak would come for me so I was unsure if she was using it to hold on or bite. Eventually I just bit the bullet and went for it and I was relieved to know that she was trying to step up rather than bite. I took her out and set her up in the smaller of the two bird rooms that will provide her temporary lodging. Since she has been accustomed to a cage for so long, I did not want to overwhelm her by letting her loose in the big room all at once. Within 24 hours Santina has been stepping up for me, dancing, and taking scratches. This will be the subject of future blog posts so be sure to check back. In the meantime, here is the video of Santina at the rescue and coming home!